This only works if the recipient of the invite selects ‘Send a Response Now’ if they simply Accept, Decline, or Tentative without sending a response there is now way to know under the directions listed. My meeting tracker columns are not useful. How can I reduce or expand the column width? You can also click on scheduling assistant under this menu instead of tracking. Thanks! That works for me, because my Outlook 2016, doesn’t have button “Tracking”. You’ll see the list of people on the left. I have managed to lose the accepted contacts at the bottom of the meeting too. So annoying! But it’s a temp solution…hopefully! 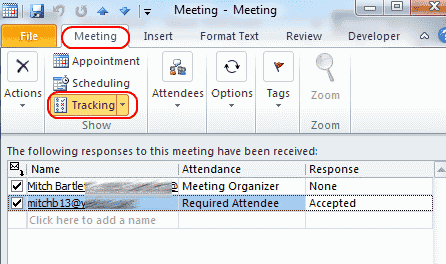 How do I see who accepted with a recurring meeting? There is no tracking option when you open it up. I have found a way to view who has accepted, declined, and not responded to a meeting invite, even if you are not the organizer. I have my work’s outlook email set up on my iPhone (currently running iOS 12 but it also worked in iOS 11). My work meetings show up in my phone’s calendar. So when I click on the meeting in my iPhone’s calendar, it pulls up information about said meeting, including the list of invitees, and whether or not they’ve accepted, not responded, etc. This works for meetings that I was merely invited to and didn’t set up. Very handy.